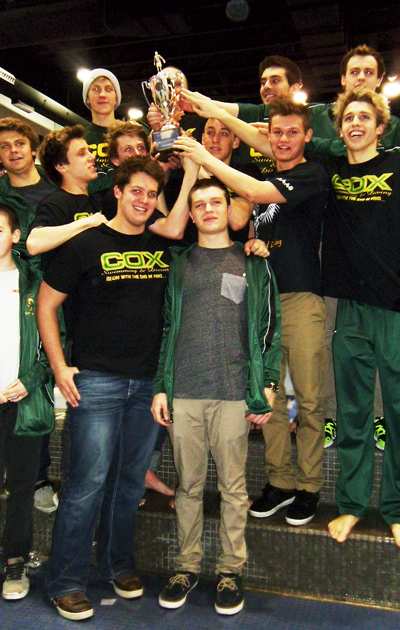 As the swim season kicked off, Cox coach Joe Gentry watched his team underperform. The Falcons weren't cutting time off their times. They weren't hefting enough heavy things in the weight room. Perhaps they'd started to take things for granted: that they'd win the Eastern Region (as they have every year since the program came into existence), but fall short at state (as they have every year since the program came into existence). If the Cox male swim team wanted to finally grab that elusive state title, this wasn't the way to do it. One day at practice, Gentry graphitized a new message across the board: to begin with the end in mind. "They started looking at everything with the end in mind," Gentry explained. "What do you want to do by the end of practice? With a set of weights in mind, what do you want to do in lifting? Now everything has become meaningful. When they set goals, they set goals that are very specific." Across Hampton Roads, a new face was getting her feet wet at Hickory, in every sense of the expression. Tage Waite's girls had won the region two seasons before, but not last year - and the Maury alumnus, herself a former regional titlist in the waves, was off to her start in high school coaching. "Originally, our goal was to having a winning season," Waite remembered, "and once we realized we were swimming amazingly, we went for the (Southeastern) district title." Last weekend, the Lady Hawks got there to cap off a perfect regular year. Over the weekend, the two squads - and the rest of the top teams and individuals in the area - met at Old Dominion University for regional games. But before the last rounds swimming began on Saturday, First Colonial stole the spotlight, as fellow Patriots Lauren Hadley and Justin Parr took the top marks at diving on Saturday morning. "I was very nervous, but I had to do my best," said Hadley, who completed a perfect local career with her fourth regional title. "I had a great competition." Next week at George Mason University, she, along with the Cox boys, will go for the state title that's stayed out of reach for so long. "My goal is the top three," Hadley said, "but I'm jut going to do what I always do - go in and have fun." Her score of 363 kept her ahead for the entire event; Parr fell behind early on Friday before regrouping with a top total of 340 the next day. "I knew I had had a pretty bad meet (on Friday)," Parr said, "but I wanted to come back and prove that the stats were wrong. (On Saturday) I had a pretty good meet; I was lucky that some of the competition didn't have their best day." The Cox men didn't waste time at regionals, as Nate Dacruz, Austin Temple, Carson Black, and Wesley Francis set a new regional record of 1:36.53 in the 200-medley at the prelims on Friday. The next afternoon, they shaved over a second and a half off the new mark. Teammate Ben Hansen kept things rolling in singles competition, charging from the fourth seed to take the 200-free race. Francis warmed up to defend his state 50-free title with a resounding win in the race, then got the 100-free title as well. Temple set a new regional record in the 100-breast, and Dacruz won the 100-back and -butterfly. Hansen, Temple, Francis, and Dalton Malaby set a new local mark in the 200-free relay, and Hansen, Malaby, Dacruz, and Ben Collins notched another new low in 400-free competition. All in all, the Falcons dominated the day, their final score of 467.5 over 200 points higher than second-place Princess Anne. Four months ago, very few in Hampton Roads swimming had heard the monikers of Taylor Jones and Susan Hynes. After Saturday, it's unlikely the two fresh(wo)men will be forgotten for a while. 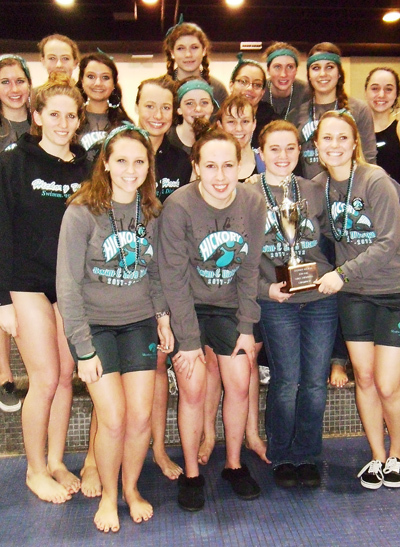 Jones won the 50- and 100-free for Great Bridge, while Hynes set a regional record in the 100-breast and helped Hickory's 400-free relay team ice the meet with a resounding win. Winning, Jones explained, is, "a good feeling, because I know all those hours slaved away in the pool have really paid off. It's a moment you can't take away from anyone. I love being the underdog, chasing down people who are older and more experienced than me. I like working hard, being able to catch up to them and beat them." Hynes teamed with Emily and Alex Egress and Shannon Loud for the 400-relay win, the Lady Hawks' third of the evening. "It's really fun, and I got some great teammates," Hynes said. "They all pump us up. We talked about staying strong, and giving our all so we can kill it. I was psyched." While one pair was making a collective debut at the meet, another took a farewell tour, for the time being. Just as has been her custom for years, Maury's Madison Kahn roared off with the 100-backstroke title, though she didn't break her own regional record. Next week, she'll try to set a new state mark in the event - for the third time in her career. "You go until you can't go anymore, and then you go faster," Kahn explained. "You don't really think; you just want to go. I was just really pumped to go out and give it my all, to show what I got for my last year. I'm going to give it my all at state." Next year, she'll team with Menchville's Amanda Carner as newcomers to the University of Tennessee. Carner, who on Saturday broke the 200-individual medley relay mark that she'd set the night before and won the 500-free by over 18 seconds, goes for her first state win next week. "It's about endurance, and so many repeats at practice," said Carner, who used the Tennessee theme song of "Rocky Top" for her introductory tune on Saturday. "I had some good races tonight. I was glad to go faster than I did yesterday." With just four races left, Waite's team clung to a 179-162 lead over Bridge. "I told them that they needed to step up and leave it all in the pool," Waite said. "I didn't want them to get to the wall and say that they could have done better. I wanted them to get to the wall and know that they had swam as fast as they could." They responded; Leah Ange, Elizabeth McClaugherty, and the Egress sisters took the 200-free relay. Hynes got her 100-breast win, then teamed with Emily, Loud, and Elizabeth Johnston for the finishing touches in the 200-free race. The Lady Hawks' 299.5 edged Bridge's final of 230.5 and Anne's 216. "I was really nervous, but really excited, because we've been training so hard all season," said Alex, a member of Hickory's regional titlist team of two years ago and future attendee of William and Mary. "Everyone just put in 100 percent effort every practice, every meet. We came into this with a really good state of mind. I really wanted to be able to go to states for my senior year. We can't wait for next weekend." As the Cox team celebrated yet another title, they could finally kick back and relax. But that didn't mean that they'd really be able to do so. On and off for the past eight year, Gentry's been fighting off prostate cancer. As his team tried to stay warm and warmed up over Christmas break, Gentry was forced to the sidelines by chemotherapy. "It's a motivation for us," Temple said of his coach's issues. "We want to do better for him. Whenever we start slacking in practice, we think of Gentry, and it makes us go faster. We have a lot to live up to." Once the state games get finished, Gentry's scheduled for one more round of treatment. Everyone hopes it's the last one he'll need. "I want to be a living example so the kids can see that someone with cancer can still get up and function and have a normal life," he said. "They have been so supportive. They are very protective of me. At practice, they ask if I really need to be there. I say, yeah I do, because I'm not there. It's missing more for me than it is for them. They are like a family."